So again, it's been awhile since I did a clothes post, I blame crazy work, yeah, mostly work. It's that weird time of year again, when I am not sure how to dress. It's freezing in the morning and 80 when I get out of school. What's a girl to wear?? This was a random one...I actually really dislike this dress...it fits weird and cuts you in half, but with a scarf I feel like it looks, not so weird, so I gave it a try and everything came out all right! My last time wearing sandals, for the year, well at school, at least. It feels strange to be in almost October in Colorado and be wearing sandals, right?! Okay, I lied, I wore flip flips one more time... but no more, it's boots and flats from here out. I mean these shoes, come on! I bought them for like $12 at Target on a whim and they are brilliant. My student teacher wore them all the time last year and she kept trying to convert me. And I was all, like, no, it's not my style... and it's not, but I love them! This was a chilly workshop day outfit. This was such the random outfit. I woke up in the blackness of 5 AM and I wasn't feeling what I had laid out to wear. So I dipped back into the closet and came up with this. I love it when a plan comes together! Dress: Kohls--a lady my mom works bought this online and couldn't return it, first sad times, but she asked my mom if I would want them. Who says no to cute clothes with the tags still on them?? Off we go to another busy week! Wednesday's are so crazy I feel like they should be on Thursday, so at least I will know that I only have to get through one more day. Who thought cramming in every meeting imaginable on Wednesday would be a good idea?? This for the our big boy's party we HAD to do a "Tracta" (tractor) Party. Which really was just a jumble of all things transportation. He has been OBSESSED with anything on wheels from a super young age, so all big equipment gets lumped together as tractors. Everything at daddy's office is a tracta. Not to be confused with buses, which he also loves, and trucks. I found these invites at Hobby Lobby... I mean, how cute are they?! Hobby Lobby also had a few other cute things for a "construction" party, I grabbed a runner, some cones, flags, etc. Everything else we had or was a dollar store purchase. I think this was the cheapest decorating I have ever done! It did help that everything was orange and Halloween is creeping up on us! Mister was pretty proud of his decorating skills! I kept the food super simple! Thanks Pinterest! I mean this is just laziness, right?? I made a few dips and we ordered pizzas, after 9 years of throwing parties, I finally learned my lesson. I would rather enjoy my guests and the kiddos, than be cooking and cleaning up the whole time. Never again! It was quite the toasty day, so we dragged out the water table and the kids played and played! Kellen had a blast and added many tractas to his collection. They have kept him super busy this weekend! We had so much fun celebrating this boy and I am so thankful and blessed by our wonderful family and friends for loving on our kiddos!! Oh my, how things have changed around the Wood house in the past 2 years. Sometimes it's still strange to think that it used to just be the 3 of us, now I can't imagine anything but the 4 of us all together. Was it really 2 years ago that we were eagerly awaiting your arrival??! Holy moly, I remember that day like it was yesterday. It was such a strange day, your birthday. Brien's mom had come over pretty early to watch Callie, the weather was strangely fall like. We left the house way earlier than the 12 pm time of check. We pulled into the parking lot at like 10:30, we both looked at each other and said, "wanna go to Target?" How weird is that?? After our shopping/killing time excursion, we checked into the hotel , hospital. I swear they said, "Enjoy your stay." A few nerve racking hours later, you were born (see last years Kellen's birthday entry for details!) Oh my, We loved you so! Having a baby is perhaps the strangest thing ever. One minute, there you are, doing your thing, living your life and the next thing you know, you have this precious person staring at you. Totally dependent on you for literally every aspect of their life. It's a little overwhelming, but I will never forget thinking, "I love you so much, how is that even possible? We have just met!" So fast forward 2 years and here we are. You are mess my boy. You are my little adventurer. Always into everything. Always playing and always on the go. You are stubborn as the day is long and I kinda love it. You have always had a big personality and it gets bigger and more opinionated by the day. For example, if it your pajamas don't have some sort of car, bus, plane, fire truck on them, you won't wear them. You are pretty content for the most part to play all day long. Outside, with Jake, with Callie. You love to wrestle. You LOVE "tractas" (anything large with wheels) You love to sing. Our current favorites are "ring around the rosey", the abc's, and "twinkle, twinkle". You think you are potty trained, which has been very interesting. Soon my boy. You love pizza, I love they way you say pizza. You have recently started adding a "peese" (please) to everything you ask. It has seriously helped you get what you want lately. You are always concerned about how everyone else is feeling. The other day I stubbed my toes on your door, and you patted my arm and asked me, "You okay, mommy?" I said I was fine and you hugged me and said, "good boy." I just can't even! I love your big brown eyes and how you can convince me to do just about anything for you. I love how you love bugs, (so gross) and how you can't leave the house without saying I love you and giving everyone hugs and kisses. Kellen, you are such a serious little thing and I cannot wait to see what you do with all that energy when you get a older. We love you more than you will ever know sweet boy! Happy 2nd Birthday! This week has been delightful! After our short labor day week, we had another shortened week due to a district wide inservice day this last Friday. After a late Thursday night Bronco game (and victory for that matter) it was pretty great to not have to teach the next morning! And it is always so nice to get out of our school building and see what's going on in other places! So Friday my team packed it up and headed to Boston K-8 for a PD. Right away we notice something was amiss... The chairs. Say what now?? Oh yes, this was a kindergarten classroom. On the visualizer was also some alarming information. We had indeed signed up for k-2 professional development. Thankfully right down the hall was a class for our new writing curriculum, and thankfully they had grown up chairs! We spent the morning getting actual helpful training and walked away with some great information that we could use. After a wonderful lunch with my favorite ladies (there was much laughter, to the point of tears) We headed to our afternoon session. Our facilitator was a hoot! He taught in an inner city LA school and was hilarious! I mean look at this guy--his shirt had pineapples and his tie was dinosaurs, how could this not be fun?! While not quite as useful as our morning class. We had a great time and learned some cool stuff. So Friday night, the kids were off having a blast with Grandma (she took all five. All. Five.) Brien and I had a date night and enjoyed some much appreciated margaritas and On the Border, thanks to a birthday gift card! Saturday morning Brien and I spent the whole day together running errands. We went everywhere. It was quite a treat to not have to snap the kids in and out of the car 27 times. We got almost everything ready for Kellen's party next weekend and even had a chance to work on the yard a little. I just can't even. That's right. Big Boy Bed. This week Kellen has discovered how to escape his crib. On Monday morning I came face to face with his big brown eyes in the darkness of 5 AM to the whisper of "you awake mommy?" Scared the pee out of me! He proceeded to every single night this week, make a run for it and stand in the hallway and say, "I get out, ok?" Nope. Not okay, Mcfly. I was a little worried about his breaking out of baby jail and getting caught somewhere or getting into something in the night. So we went ahead and just made his crib into the toddler bed. Callie was never an escaper, she was in the crib til she was about 3. So this whole boy thing is a little new to me. We shall see how it goes! Tear. Saturday night we had a quick dinner with my parents and grandma and then headed to the country for a bonfire for Brien's best friend. We had another great night filled with laughter and funny stories. Today the kiddos are back home and we have been gearing up for another week. For the next few weeks we are going to be busy with birthdays and trips so it's nice to enjoy the quiet. Hopefully I will have a chance to post some more and get back into my crafty ways. I am getting my life together. Feeling a bit behind this week. I think this year might kill me! I am sad to have zero time for important things like, my family, crafts and cooking. I need to get my life together! That has been my quote of the week. Every week at school, I found myself repeatedly saying the same things, usually to the same kids. This week the Mrs. Wood quote is, "You need to get your life together." I say this in response to children having no supplies, not doing their homework or not following directions. Last week my quote was, "Be a problem solver." I am sorry, sitting there for 20 minutes doing nothing because you have no pencil, deserves a "be a problem solver," quote from their favorite teacher. This week is a culmination of two weeks of outfits finishing off the summer and transitioning into a bit more fall-ish choices... Here goes! Feeling a little fall, looking like I only have one arm. My photographer was playing with the neighbor girl. Feelin' summery--I wore this to our neighborhood labor day BBQ. My last white skirt for awhile! Vest: Target--little girls dept. Cuz, sometimes kid stuff is better than the lady section! And there you have it! Two weeks, now I am all caught up and I can get some memory space back on my phone! Yay! So hopefully I will take my own advice and get my life together and find more time this coming week to do somethings I actually enjoy! Happy hump day! We had, not a lot of time for relaxing, but we sure packed in the fun! Saturday morning the children and I had big plans with Brien's mom and Aunt and the littles to go to the zoo. Kellen had not been since he was super duper little. He loves animals SO much, I was thinking this would be a great chance for him to get to see all the crazy animals that makes noises for in the books. They had so much fun! The strollers were ditched in a manner of minutes...and Kellen and Christian were off! We arrived super early so they animals were all out and awake. It was perfection, really. Kellen LOVED the lions and the elephants. We definitely spent most of the day at these exhibits! This one is quite real! There was also this neato lego exhibit with animals and plants. Callie Rose just had to have her picture taken with the giant lego rose! Also a fake, but they were really fascinated by this polar bear! Waiting for the elephant feeding show. It was truly amazing to see these giant animals up close and personal. The kids were absolutely in love! and of course we had to get some splashing in, this my friends, is what joy looks like. Splashing with your cousin at the zoo! After our little zoo excursion we had a little BBQ with my family for my mom's birthday. I made my annual holy-moly terrible angel food cake. It looks a hot mess. but I promise it was delicious! Papa got the shot of the day, with these cuties. I would have been so much better minus the paci--we are working on that! On Monday Brien and I went car shopping and I traded in the old jeep for a new Civic. I have had a love/hate relationship with that black behemoth since the day I bought it. Black cars are a terrible idea. Period. You know what else is a terrible idea, buying a car on labor day weekend. I dislike the car buying process in general. It takes so looonnnggg. I even knew exactly what I wanted. I was thinking in and out in, 2 hours and done. FIVE hours later, my shiny new ride was ready for me to take home. So, total waste of a day, but now I have a fuel efficient, white, girl car and I love it! Why can't every weekend be a three day weekend. I feel like the world would be a better place if we had one less day of work and one more day of play! Umberto dry shampoo, where have you been all my life?!? If my hair doesn't get washed everyday, I look like exxon should set up a rig on my head. Not anymore! This is the best stuff ever and it's like $9 at Target. You just spray it on and fluff it up a little and your 'do is good for another 12 hours, at least. I have become a believer! This book! I read it last week and it is so funny! A totally different book than I normally read. 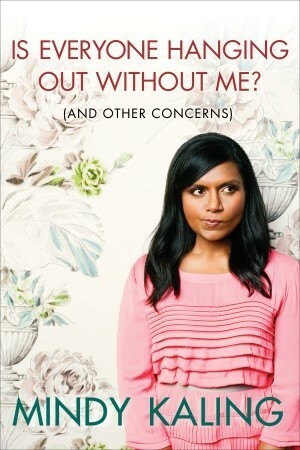 Mindy Kaling is one of my favorite people from the office. I feel like we would be friends in real life based on her adventures from the book! My sister in law shared this little gem with me last week. I don't know why, but I laughed so hard. It's terrible I know, but sometimes I think my children just make messes to watch me clean it up later. My house will not be shiny clean until 2031, at the earliest. I guess I can live with that, but I am kinda over toys and sticky everywhere. That's all for now. Maybe next week I will be able to enjoy the b-log a little more!